Taking a peek behind the bulkheads of the latest raft of boats on display at the recent Sydney International Boat Show revealed various creative ways of cabling, but this may all change soon. Coinciding with the show was the announcement from the National Marine Electronics Association (NMEA) of the new OneNet standard incorporating the industry-wide Ethernet cabling as a backbone for NMEA 2000 message transmission. The theory behind the move is sound in that it will give us boaters a simpler environment to plug gear into, and just like our much vaunted onshore National Broadband Network (NBN) will give us high-speed data transfer for say radar scans, sounder images and myriad other graphic heavy data. With up to one gigabit transfer speed directly to the OneNet devices, Ethernet is 400 times the speed of the current NMEA 2000 CAN-bus systems and the new arrangement may incorporate another NBN technology — fibre optic cabling for ultra-high-performance data transfers. Device numbers supported also explode into the stratosphere, moving from the current limit of 50 to 65,024 physical devices, so superyacht builders will smile. Another major bonus is reducing the number of those pesky power cables — thanks to Power over Ethernet (PoE) each physical device may be separately powered by up to 15.4 Watts directly from the Ethernet switch; and finally, global video standards will be incorporated. 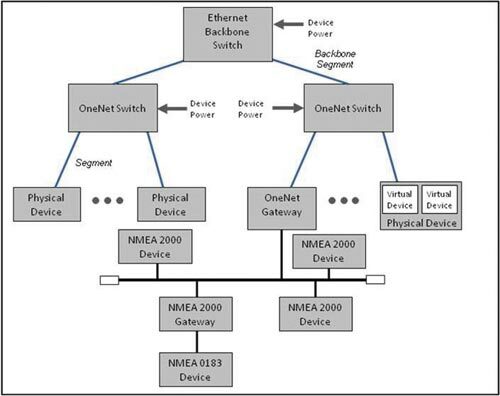 As a former computer technician I’ve installed many kilometres of Ethernet cabling over the past decades, so it’s a welcome announcement that the NMEA has recognised the ubiquity of this cabling, which is already in so many marine systems, and announced the OneNet standard that will launch in 2014. But as the saying goes, the devil is in the detail, with critics complaining the NMEA is weaving a twisted web for its own ends. "Why develop something that already exists in Ethernet protocol and is widely used in mission-critical systems across the planet?" is the clarion cry of those not part of the NMEA’s new proprietary standard (rather than an open IEEE standard). Already onboard the good ship NMEA OneNet are those who initiated it in the first place — the big four marine manufacturers and several others. Without getting too technical the crux of the matter is the integrity of data packets sent through the cabling, with NMEA purporting that a highly specified standard is needed to overcome criticisms of latency and other shortfalls in Ethernet protocols — so that, say, your radar data is transmitted without lag or interference. Some of the other devils in the detail will come from the hardware to be established and how OneNet deals with the onslaught of consumer electronics being used onboard, such as the iPad. Looking at the hardware, all the big four — Raymarine, Navico, Garmin, and Furuno — use various waterproof and splash-proof connectors already, so establishing an industry standard one (that still fits through small spaces when cable running) will be challenging. Back at the Sydney boat show the good weather had visitors parading on the pontoons, rather than patronising the indoor halls. However, there was plenty to see inside, despite the lack of many newly released electronics. I was particularly interested to get up close to the new lithium batteries on display at the Aquavolt stand. These batteries are the quiet revolution in boating, up to 70 per cent lighter so probably the cheapest way of reducing onboard weight, despite the relatively high cost. Very much an emerging technology in stored power, lithium batteries are also generally smaller compared with lead acid or AGM units, so ideal for smaller boats and of course weight-critical racing yachts. The downside remains their high cost and charging requirements are critical, though becoming less so as their inbuilt power management technology evolves. 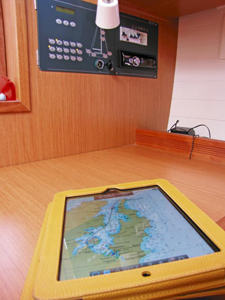 However Absorbed Glass Matt (AGM), which is a variety of lead acid battery, are increasingly used in boats as their cost now is only roughly 30 per cent above standard lead acid and they can be used for both deep cycle charging and engine starting. Top photo: Plenty new models at the Sydney International Boat Show, but will they be cabled differently in the near future by NMEA OneNet? The new OneNet standard from NMEA will support faster data speeds and power in the new Ethernet supported protocol. A major question about OneNet is its support for popular consumer devices such as the iPad and Android systems. 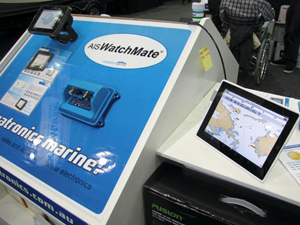 Vespermarine’s new Watchmate Vision AIS is typical of marine gear that requires multiple input/output connections; OneNet may change this. 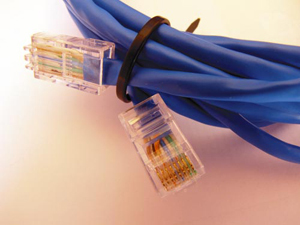 Ethernet cable is waterproofed in several different ways by marine manufacturers so one standard is needed. From Trade-a-Boat magazine Issue 431, Sept-Oct 2012. Story: Kevin Green. Photos: Kevin Green; NMEA.